Like most campaigns seem to go, it started strong, then totally lost momentum, then suddenly leapt forward at the end of the run. Looking at my referrals (full breakdown here), I’m guessing this is in large part because Kickstarter was featuring it at those times. 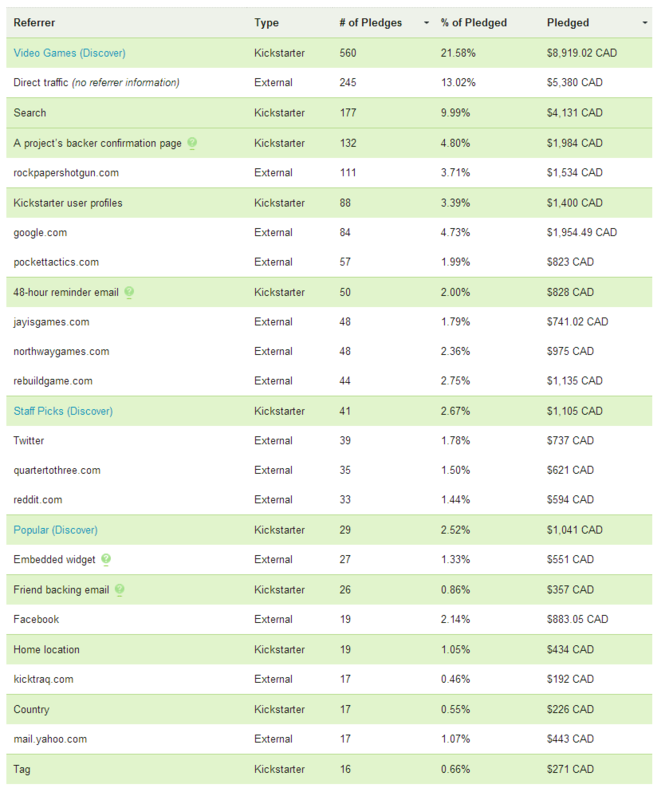 A whopping 53% of my pledges came from people who were browsing Kickstarter when my campaign caught their eye. It was a success, in that it surpassed my $25k goal, introduced new players to the game, and raised an average $19 per backer. To be honest I was hoping more existing Rebuild players would take an interest, but due to a marketing snafu it’s possible they didn’t even know it was going on. Either way, I knew it’d be a challenge to convince free Flash and $2.99 mobile players to back a PC downloadable game for $10 (no iOS version in the rewards either). The campaign didn’t come close to actually funding the game in it’s entirety, which would have required more like $150k with my time at cut rate. But I was upfront in saying I didn’t need to fund the entire game, that this money would go towards extra art and extra content and stretch goals. 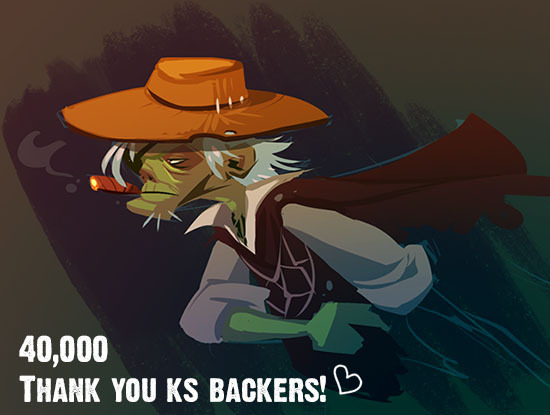 Of which we made a couple, but I’m somewhat relieved that we didn’t make the voice acting stretch goal. – Read Lobster’s guide to Kickstarter from start to finish. – Don’t use IndieGogo. I really hate Kickstarter for being so revoltingly US-centric and I know it’s not easy to make or fake a US company (or UK, or Canadian which is what I am). But if the referral numbers are truth, then over half my pledge money came from Kickstarter regulars who bumped into my game on there, mostly while browsing in the video games section. I shouldn’t be surprised; I do it myself. IndieGogo and other crowdfunding sites sadly have much smaller communities. – Make your video pure gameplay footage set to music. Recent uber-successful campaigns have done this, implying that people are more interested in the game than the story or people behind it. Filming yourself is way too much trouble, especially if you freeze up in front of a camera like me. But Colin was a very patient director and we eventually did get through my lines after 5 mornings of filming. We thought my story of being a (mostly) lone female dev living in the jungle in Panama might catch some attention, but backers seemed to be more excited by the gameplay. – Don’t bother with physical goods at all. Other devs report they are too much trouble and talked me out of doing a board game as a reward (I know: awwwww). Despite an early poll that showed my fans had no interest in t-shirts or stickers, I did them anyway because dammit I like those things. It was only possible because I found a company (Teelaunch) that would produce and ship them for me. – Put people into your game at all levels. Stick their names in the credits ($1), on randomly generated characters in the game ($25), draw stylized versions of their faces for random characters ($100), or make them full named npcs with stories and events in the game ($500). Offering these rewards was one of the reasons I wanted to do a Kickstarter campaign in the first place. – Offer exclusive in-game content. I felt torn about my $20 reward tier which gave players unique starting stats for their main leader. On one hand, it smelled like DLC to me to write content for the game but withhold it from regular players. On the other hand, backers were genuinely excited about it and it cost me little to do. – Plan something to talk about. I listed the npc gangs, announced the soundtrack, talked about the art and my travel/work lifestyle… but then it devolved into short notices about milestones peppered with gratuitous character sketches from Sara. I wish I’d prepared more in-depth articles about game features since backers did (surprisingly) seem to read and enjoy them. – Add rewards in the middle of the campaign. My theory: once backers have read a few updates and are getting excited about the project, they’re looking for a reason to increase their pledge. I did additive “everything above, plus” reward tiers so when I added the soundtrack at the $35 level, all the higher tiers included it too. – Invite backers to vote on something. I had some controversy when I added the Relationships & Kids stretch goal. I didn’t explain it very well, I think I made it sound like playing house in The Sims. Anyway it got backers talking which seemed like a good thing even though they were angry, so I told them they would instead vote between that and the Seasons stretch goal. Half the comments in my whole campaign probably related to this. – If you don’t need the money, don’t worry about the money. Unlike many projects, I had other options for funding. I used the campaign as a promotional tool and to gauge interest so I wouldn’t kill myself making the game perfect if nobody wanted it. I chose a relatively low goal ($25k) and reached it in the initial rush. I did promotional stuff for 2 hours every morning plus one full day a week, but didn’t feel the incredible stress that most teams seem to. It may not have been a huge financial success, but I did raise awareness for Rebuild and started a sense of community that I hope to carry over into the alpha & beta test. ← Rebuild 3: Only 2 days to go and new $40k stretch goal added! I missed the kickstarter completely and am a bit bummed. I’d love to get in at the beta-testing level and would still pay at that level if it were possible. I don’t know if this was a google play thing, but my app of rebuild updated with an ad for the kickstarter the day after it had ended. If it had been sooner, I would have jumped on it. Congrats on successfully funding and I look forward to the game. Also, I could not afford to sponsor at the corporate level, but I was tempted, especially since my business is one a few with more practical value in a zombie apocalypse than now. I’m another case of someone who didn’t even hear about this until it was already done. While I’m not a big Kickstarter funder, I _have_ done others before (Dead State comes to mind), and I’ve enjoyed Rebuild enough I’d certainly have tossed a few bucks at it. Never underestimate some percentage of people who don’t back because some element of the project puts them off; you mention the Relationships and Kids thing, and my reading of some comments suggests some people really, really didn’t like the art style (neither of those would have stopped me). Either way, when its done and shows up on one of my usual haunts (Gamer’sGate, GOG or Desura), you’ll have my ten bucks. just a question about other games… is there any statistics available for rebuild 1/2 on flash sites and mobile sales popularity over the duration of the kickstarter? was there a little increased surge for them for example? I also missed kickstarter campaign, even though i am fan of Rebuild series and occassionally browse through kickstarter. So maybe this is something you could think about from marketing perspective (but not before R3 is finished, please :) . i am not sure, but do you have email addresses of Rebuild players? Simple newsletter to fans might have brought much more in? Is there any option to still participate in “funding”? I only now discovered you even considered doing Rebuild 3. Hell, I didn’t even know you had a mobile version for Rebuild 2. I played your games on Kongregate and I’m sorry there wasn’t any message or significant marketing push there. It’s true that the free flash games player community isn’t known for spending large amounts of money, but we are buyers, and 10$ is very reasonable! I have followed Rebuild from the very beginning. It’s one of my favorite games and I was thrilled to know you are continuing the saga. I’m bummed to find out I missed the kickstarter, I’d have loved to contribute. Be that as it may, I hope you find a way to include relationships and keep the weather option! I wanted to let you know I would love to buy a shirt (or two). If it’s still an option, please feel free to contact me and let me know. I was scrolling through Google play a few days back for a game that included survival, teams, scavenging, ZOMBIES!!! And others. I stumbled upon rebuild (I guess its rebuild 2 or mobile) and I liked it. It proved to be a great game. Wish I knew about it from the start! Great game and great work! Rivers would be cool so would a coastline!!! And factions!!! (That u can interact with) awesome!!!! Great job hope this game becomes ranked number 1 if it isn’t already in the zombie post apocalyptic genre!!!! Oh I also like the new ui and vector characters hope u have more customization for your character! Oh almost forgot hope I’m not asking for too much!! Gets you into the action!!! everythin you need to know in one day or even one month. couldn’t possibly handle all the clients soliciting their services.